Kyle: What pedagogical strategies have you employed that allow students and/or community members to a) recognize the influences that shape the way they see, value, and experience natural landscapes? b) how has that particular understanding resulted in the marginalization or outright dismissal of those peoples who approach those landscapes with a different—sometimes competing—view? How do we see the complexity in natural spaces? What is the role of art in translating this complexity? What does privilege and oppression look like in contested spaces? 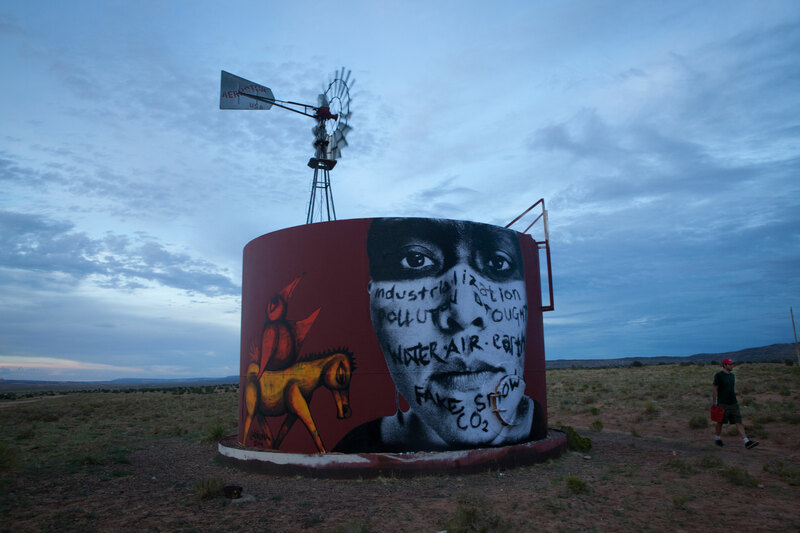 How can art be used to transform our idea of were oppression takes place, and what it’s impact is on people and landscapes? me: Thanks for giving me the opportunity to evaluate and discuss my process. I find the introduction to your question revealing in that it reflects your position as an academician. You ask “What pedagogical strategies have you employed that allow students and/or community members to…” This language is troubling to me in that in assuming I practice a “pedagogical strategy,” it creates a false power dynamic with me in the role of teacher and the community as student. Yet in my 28 years as a primary care physician and more recently as a public artist on the Diné nation my role is both teacher and student. 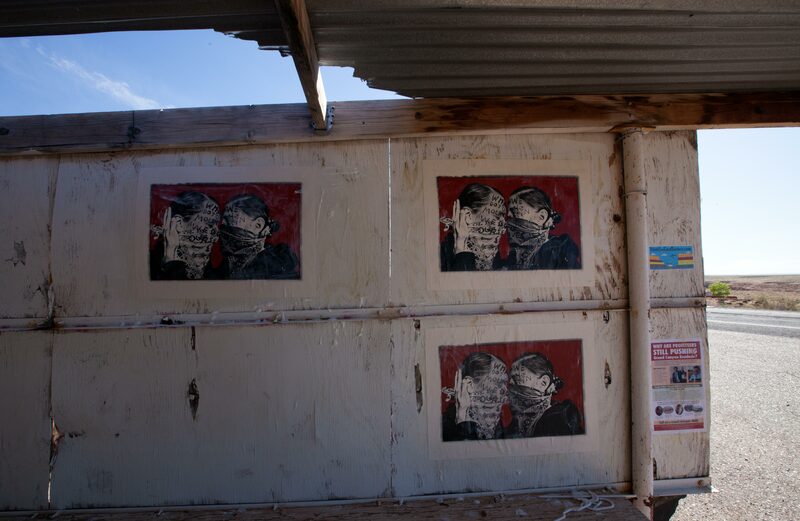 Certainly as a public artist interacting with the community while erecting work often in areas where I’m not known as a physician, away from my power base, I am primarily a student. 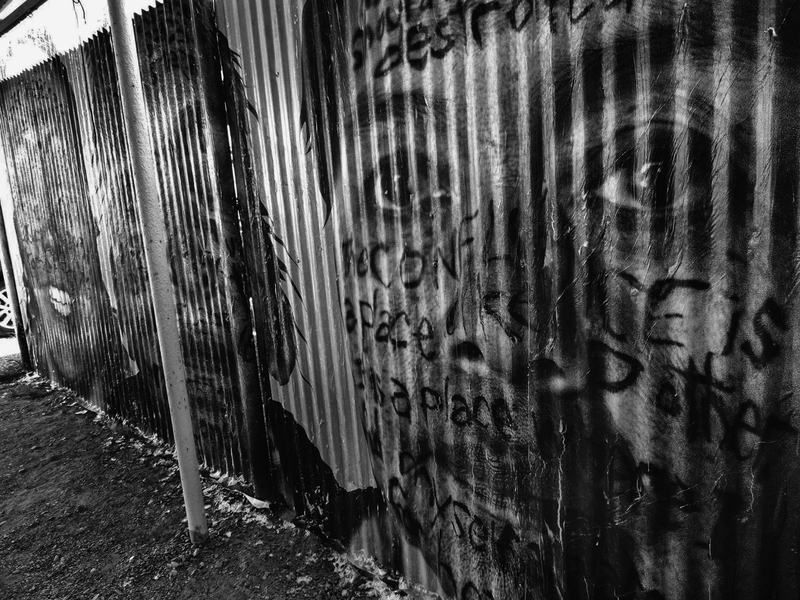 The scale of my work and its presentation as large black and white images of people from the community challenges people to perceive their surroundings differently. The work appears on manmade structures but is presented in such a way that it reflects the vastness of the Colorado Plateau in its scale. 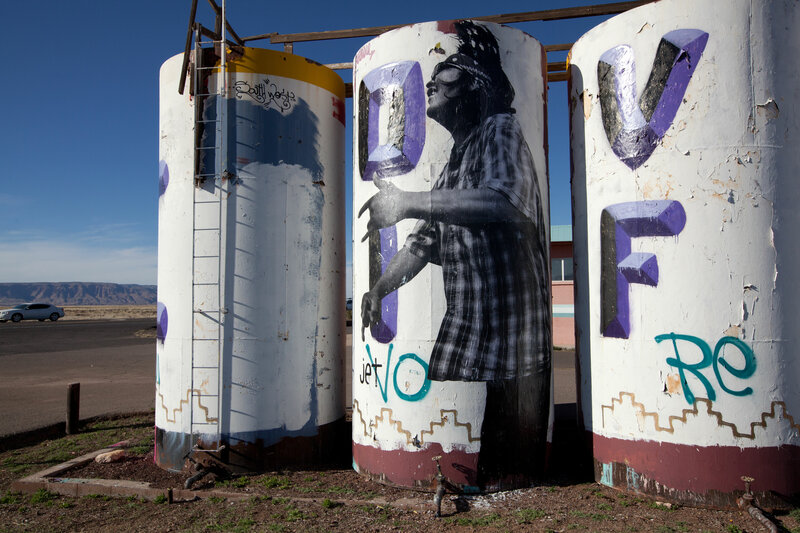 The reservation doesn’t have a tradition of public art or muralism. While people are accustomed to seeing photographs their primary association with photography is color images on a monitor, in magazine or on billboards. The scale of my images and it’s presentation on manmade structures along the roadside influence the way people see, value and experience natural landscapes. The art is also an opportunity for me to challenge the community to see not only the natural environment (landscape) differently but their social environment differently as well in that a lot of the imagery I chose celebrates the culture. 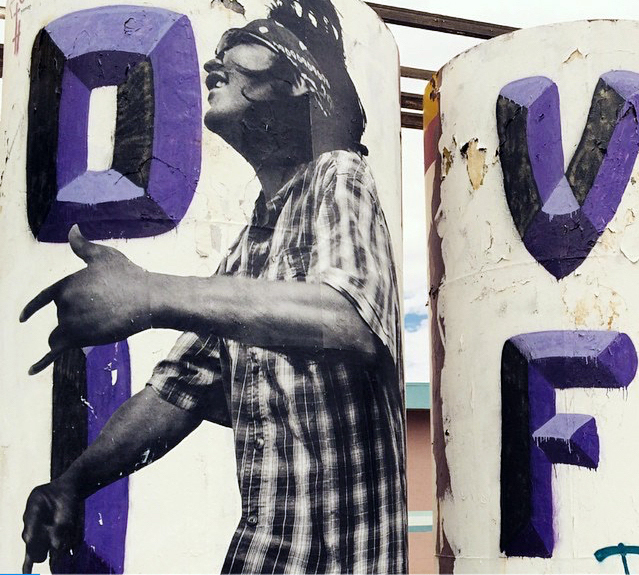 While one might object to the presentation of unsolicited murals as intrusive; the work is on par with the intrusiveness of advertising but it’s intention is to foster a sense of pride and enhanced self esteem. Most people have come to accept advertising even in unadulterated, natural landscapes even if they don’t agree with what’s being promoted. 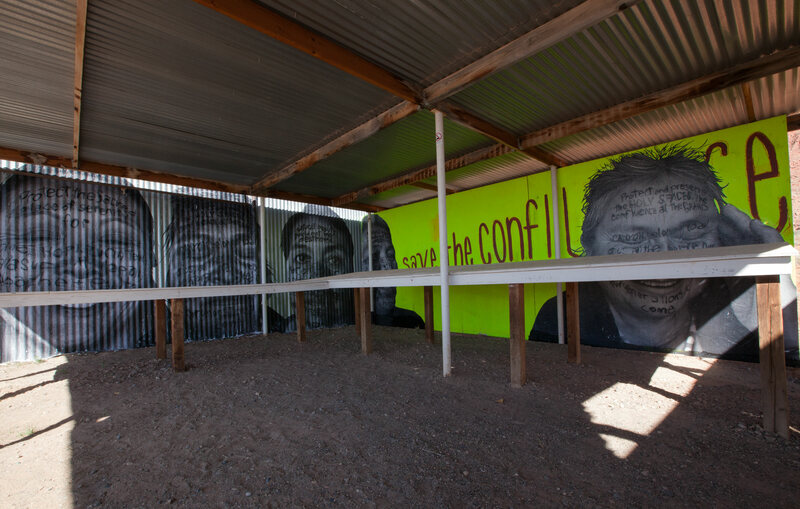 Simple, large, black and white depictions of people who inhabit these spaces invite viewers to engage those people and to create dialog both within the community and between outsiders and community members. This is in contrast to the purpose of advertising images found concurrently in those landscapes. How has that particular understanding resulted in the marginalization or outright dismissal of those peoples who approach those landscapes with a different—sometimes competing—view? Those people with contrasting, competing interpretations of the landscape and the art that appears in the landscape are not without means to challenge my work in that it’s sometimes defaced. 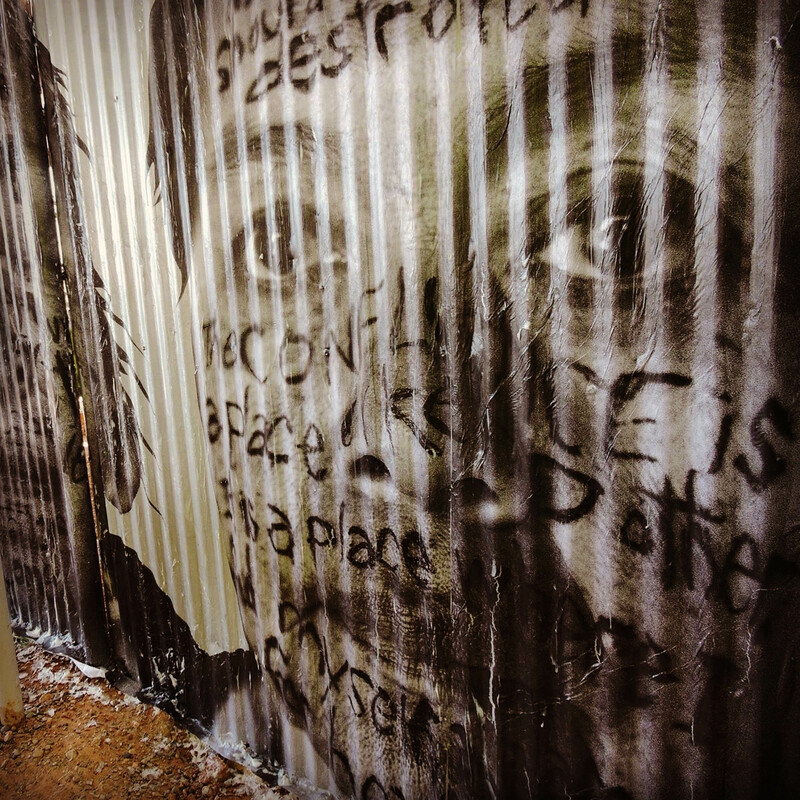 For this reason public art and more specifically street art is considered the most democratic of art forms in the way this dialog between practitioners and the community evolves. 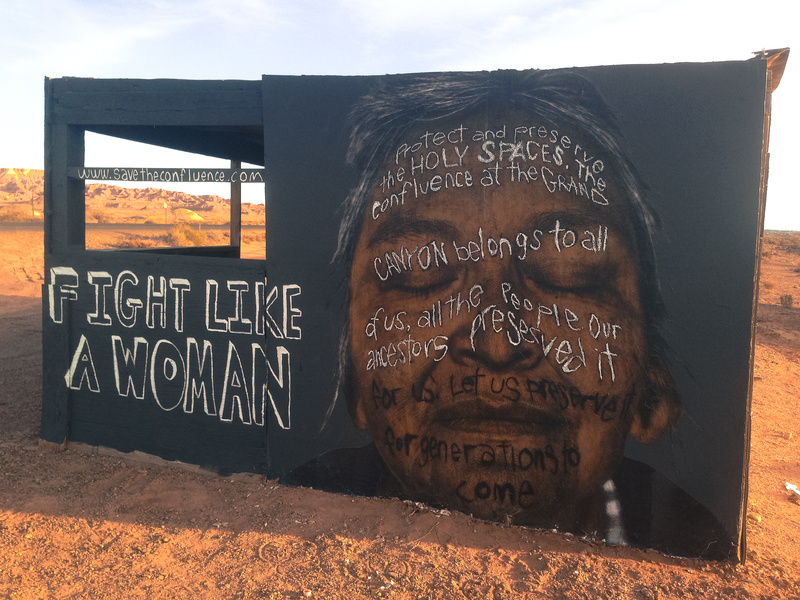 As a case study, let’s look at art that is currently being generated in public spaces on the reservation and in Flagstaff to honor the sanctity of sacred spaces, specifically the Confluence of the Little Colorado River and the Colorado River. 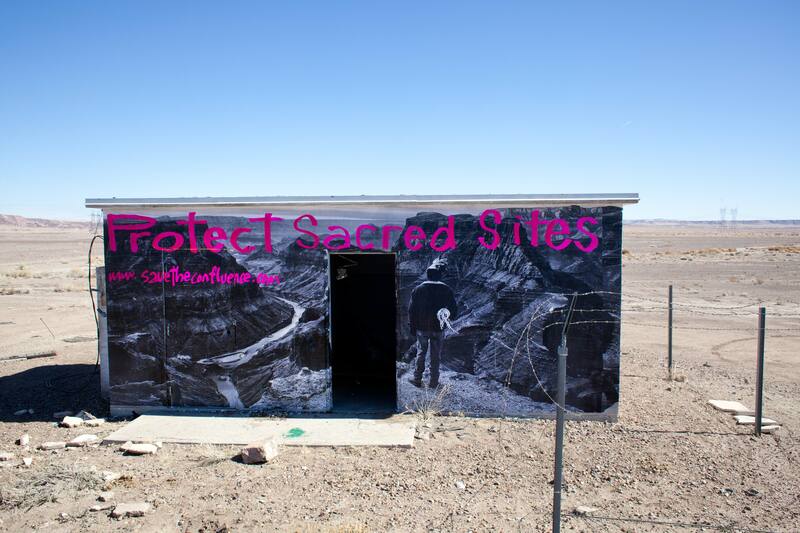 This is a site where a developer based in Scottsdale is proposing to build a resort that’ll impact the ecology of the area as well as the way various tribes that hold this site sacred will relate to one another. As a consequence the tribe is divided over the issue as the Bodaway Gap/Cedar Ridge communities on the reservation have an unemployment rate around 60% or higher. There are few employment opportunities around this area. A reductionist view of the question being asked by Traditionalists who oppose the development is whether its worth sacrificing the culture for short sighted economic development of one of the 7 wonders of the world. 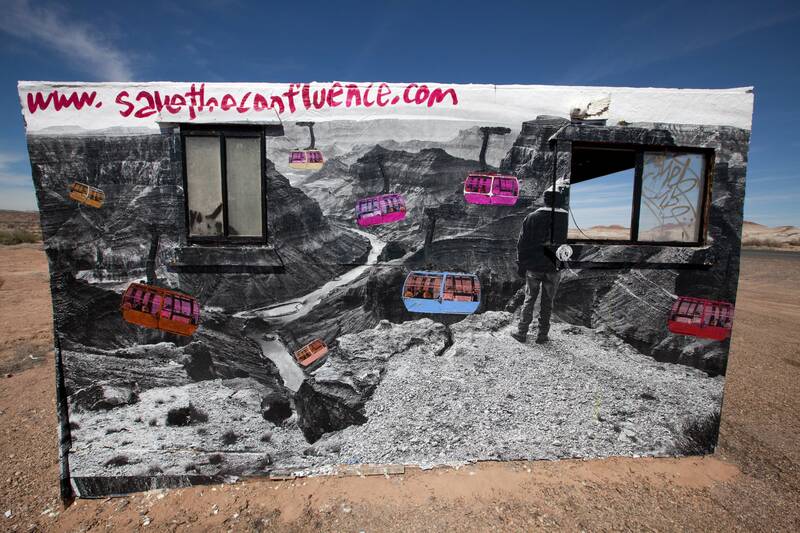 Art that has been generated around this issue speaks to the uniqueness and sacredness of the Confluence and the Grand Canyon without consideration of the competing view for economic exploitation. There are times when art shouldn’t be objective and has to take sides. Perhaps it’s considered propaganda but artists have to decide where they stand on an issue, understand their intention and feel good about their role in supporting the good fight. How do we see the complexity in natural spaces? 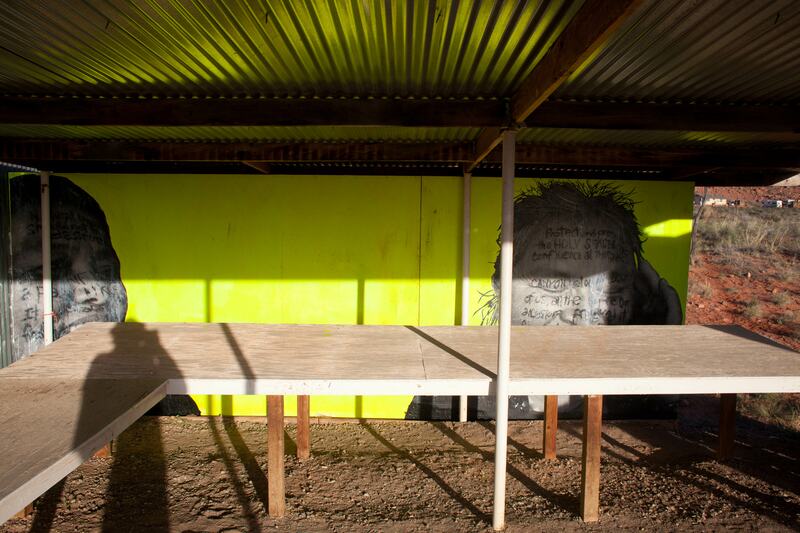 What is the role of art in translating this complexity? 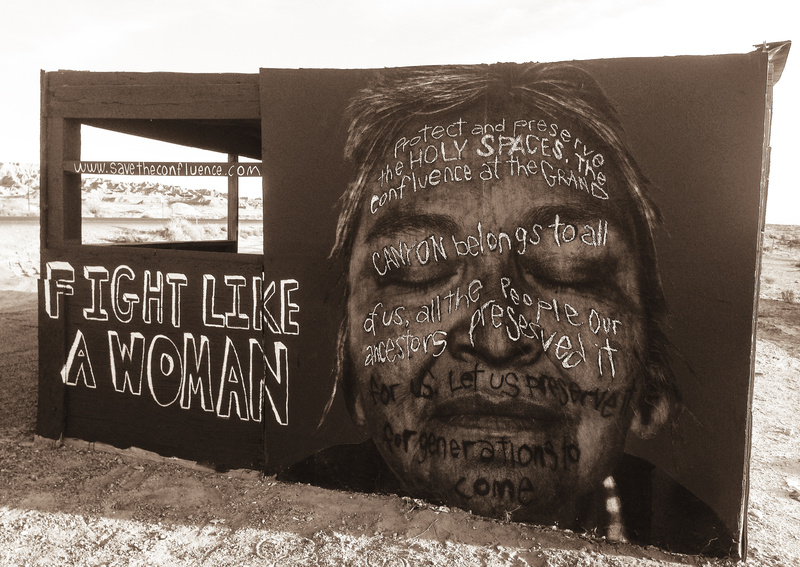 What does privilege and oppression look like in contested spaces? 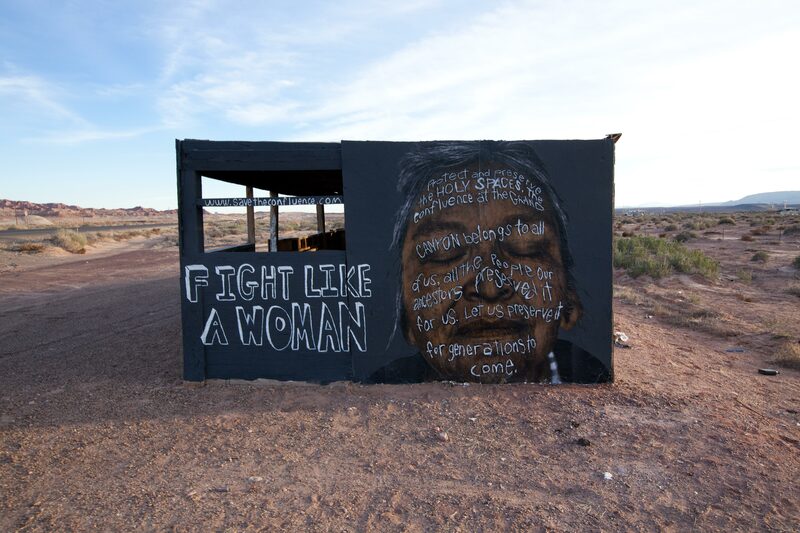 How can art be used to transform our idea of where oppression takes place, and what it’s impact is on people and landscapes? My art project is an example of how privilege looks in contested spaces. I think frequently about how my day job as a physician supports my passion for creating public art yet the public art is used in a way to support my work as a physician. By this I mean my work in the clinic is to promote wellness while my work in the field as a public artist promotes emotional and psychosocial wellness. But no doubt the medium I chose for public art is heavily dependent on a consistent funding source to create it (otherwise identified as my salary). I’d suggest billboards represent a form of oppression in contested spaces. For example, in 1989 the Pepsi corporation erected a billboard along Highway 89 near Moenkopi Wash outside Tuba City directed at motorists traveling from Flagstaff and Phoenix to Page and points further north. 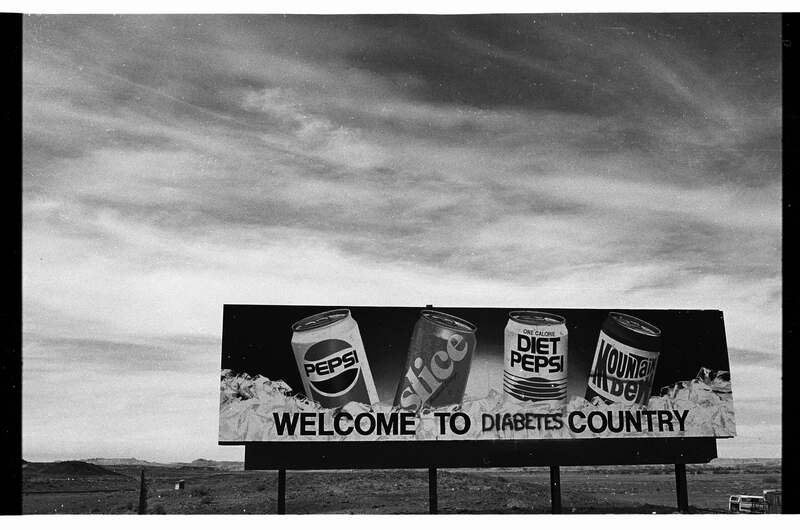 The billboard depicted cold, refreshing cans of soft drinks to relieve the motorists thirst traversing the hot, barren but beautiful Painted Desert. However, the ad neglected to recognize that the corn syrup laden drinks depicted appear in a region of the country with one of the highest rates of adult onset diabetes. Art was used to transform our idea of where oppression takes place. Thanks again for this opportunity to share my process + philosophy. 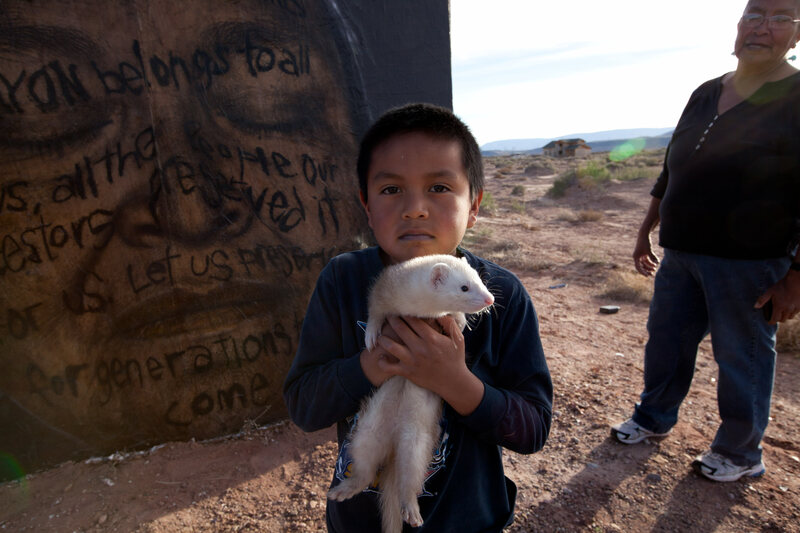 serita dale’s grandson with his ferret. renae yellowhorse for save the confluence.